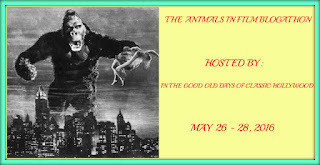 This is my entry in the Animals in Film Blogathon sponsored by In The Good Old Days of Hollywood. Crystal at In the Good Old Days of Hollywood wanted to pay tribute to all the great animals that had appeared in movies over the years. I am sure she was expecting (and got) entries like Lassie, Rin Tin Tin, National Velvet, That Darn Cat, you know the cutesy animals of bygone days. So I suspect she was initially taken aback when I suggested Harvey. After all, Harvey is never physically shown on screen, and is not, in fact, even an animal. Harvey is what is referred to in the movie as a "pooka" which is a mythological spirit that, as described in the movie, often takes the form of an animal. Thus for Elwood P. Dowd, Harvey is a 6 foot 3½ inch rabbit. 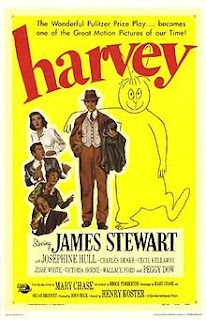 And Elwood is the only person that can see Harvey, although many friends humor him, even if they do think he's bonkers. 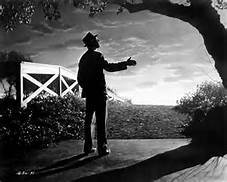 The movie begins with Elwood P. Dowd (James Stewart) leaving his house for the day, accompanied by his invisible friend Harvey. His sister, Veta (Josephine Hull) and niece Myrtle Mae (Victoria Horne) watch him in anticipation. 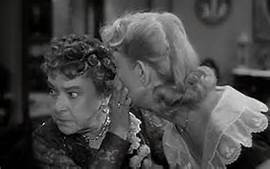 Dotty old Elwood is not a wanted guest this afternoon, because Veta has scheduled a party to try to introduce Myrtle into society, with the object of eventually landing her a husband. To ensure that Elwood is kept away, Veta enlists the help of a friend Judge Gaffney (William H. Lynn). 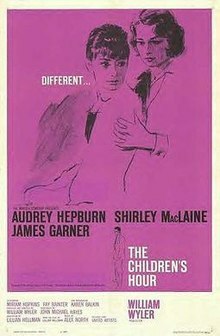 The Judge promises to put a man on following Elwood, but the man gets injured, unbeknownst to the Judge, and can't do the job. Meanwhile Elwood learns of the party. Being hopelessly befuddled, he thinks Veta just forgot to tell him and goes home (with Harvey). He tries to introduce the society ladies to Harvey and they all run screaming for the exits. Veta is at her wits end, and with the help of her friend the Judge, decides to have Elwood committed to an institution. Thus begins a riotous sequence of events that rivals, in my opinion, Arsenic and Old Lace, for queer antics and misconceptions and confusion. In a nutshell, Elwood is taken to a room, but he seems to be the normal one when compared to Veta, who is sometimes frantic and hysterical over her brother's antics. 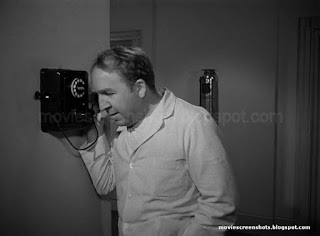 As a result, the doctor on call, Dr. Sanderson (Charles Drake), has her committed and Elwood released. 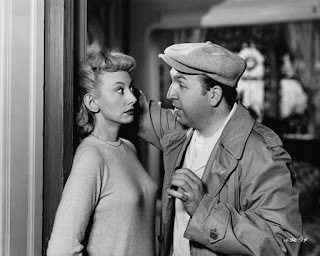 His nurse (Peggy Dow), is remonstrated for having committed the wrong person, but she tells him it really was Elwood who was to be the patient. 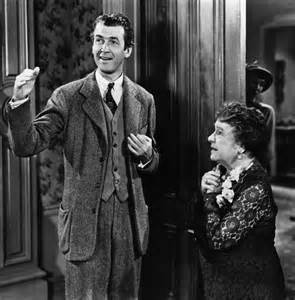 Elwood, meanwhile is wandering out of the hospital and encounters Mrs. Chumley (Grace Mills), and asks her, if she sees Harvey, to tell him where Elwood has gone. It is at this point that Elwood reveals that Harvey is a pooka, but like those of us in the audience watching it for the first time, she says "What's a pooka?" There are some hilarious scenes with an orderly, Wilson (Jesse White), who almost steals the show in every scene he is in. 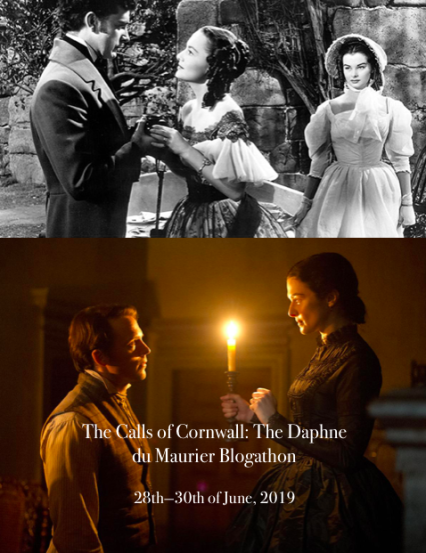 He and Myrtle begin to fall in love. He is probably the least believable Don Juan to every come on the screen, but Myrtle really likes him. "P O O K A. Pooka. From old Celtic mythology... a fairy spirit in animal form, always very large. The pooka appears here and there, now and then, to this one and that one. A benign but mischievous creature, very fond of rumpots and crackpots and how are you, Mr. Wilson?" Eventually Veta is freed and everyone goes looking for Elwood. Dr. Chumley (Cecil Kellaway), the head doctor finds him first. The rest eventually catch up to Elwood who is alone. He tells them that Dr. Chumley and Harvey left together. As ridiculous as it may seem to the audience, there is some suspicion that Elwood caused some harm to the doctor. The whole crew go back to the sanitarium, which Elwood, sweet innocent soul that he is, is willing to be given a serum that will make him "normal", to make Veta happy. Dr. Chumley is there and wondering what to do about Harvey. (It seems that now someone else besides Elwood can see him.) Elwood has a long chat with the doctor about Harvey's innate abilities and the doctor wishes that Harvey could stay with him. Harvey has his own ideas though. Harvey is without a doubt the best use of Jimmy Stewart's down home serene demeanor and is one of the best comedies of the classic era. Proving even to a hardened 80's juvenile comedy lover like me that funny doesn't have to have sophomoric humor and four letter words to be funny. 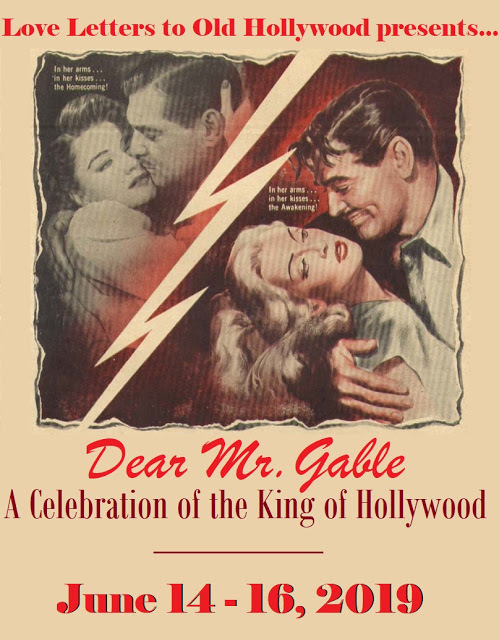 Stewart came in behind Jose Ferrer in the voting for best actor of 1950. (Ferrer won for playing Cyrano de Bergerac in the movie of the same name). But Josephine Hull did win a statuette for Best Supporting Actress. Check it out. And thanks to Crystal for putting up with this stretch of the blogathon parameters. As someone who has held a firm belief in Harvey for many years, I don't see this as a stretch of blogathon parameters at all. Neither does my friend here. 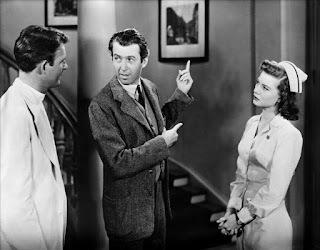 The first time I watched this film, I desperately wanted James Stewart to NOT be found crazy. But the film was so funny and charming, I couldn't take issue with the conclusion. 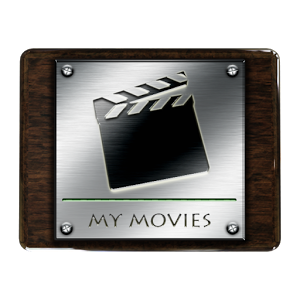 This is a great choice for the blogathon. I would never have thought of it. Great review! Just because Elwood sees something that no one else sees does not mean he's crazy. How do we know that he isn't the only sane person and everyone else is crazy because they DON'T see Harvey? Now there's a conundrum to keep you awake at night. Thanks. I've got to admit I didn't really get this film - I feel like I'm one of the humourless characters in it who can't understand what's going on! Maybe I should give it another try. 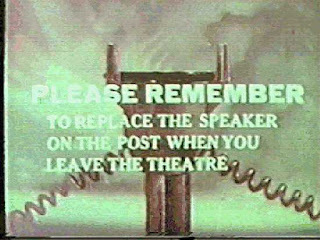 But I enjoyed the inclusion of an imaginary rabbit in the blogathon! I imagine there is that occasional few who won't appreciate the humor. But you are on the right track if you can at least appreciate my frame of mind in including an "invisible" (who says it's imaginary??? :-D) rabbit. Harvey is a very lovely film. 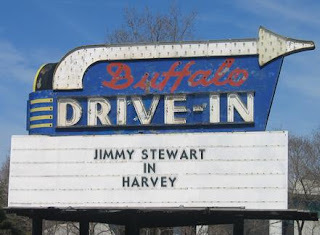 I really enjoy Stewart's calm, friendly touch to the character, but I'm another one who would like to see Joe E. Brown and Elwood!